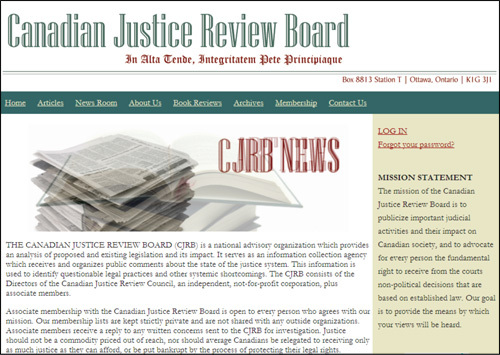 One of my favourite websites, which I browse often, is the Canadian Justice Review Board website. The CJRB is a “national organization which provides an analysis of proposed and existing legislation and its impact. It serves as an information collection agency which receives and organizes public comments about the state of the justice system.” The mission of the Canadian Justice Review Board is to publicize important judicial activities and their impact on Canadian society, and to advocate for every person the fundamental right to receive from the courts non-political decisions that are based on established law. Our goal is to provide the means by which your views will be heard. You may recall that OLA Director of Research, Elizabeth Marshall, was appointed to the CJRB, in part because of her research on Crown Land Patents. Why do I visit this website a lot? One look at the information under the Articles tab and you’ll understand why. There is a host of papers on The Charter, Democracy, Law and Order, and Property Rights, to name a few. There is a lot of useful information here for the average landowner. Two of my favourite topics that are discussed here are non-conforming rights and property values and assessment. Most of the content listed is available to the general public but some are accessible only to members and associate members. For example, many of the articles and information regarding property assessments can be accessed only by members and associate members. However, you can apply to be an associate member for a modest fee of $50. I would say that the information on how to appeal your property assessment is well worth the fee. According to our Constitution, Canada is founded on principles that recognize the supremacy of God and the rule of law. Check out the explanations of the rule of law on the Home page, which clearly state the importance of this. For those interested in more in-depth perspectives on the courts and how they operate, you may want to look at the Book Reviews section.